...STA-RITE Pumps & Agriculture Solar Powered Water Pump Power Increases Efficiency, Lowers Costs and Maintenance. We offer tailor-made solutions that work with you to create energy cost savings. STA-RITE Pumps and Agriculture Solar power supply offer one of the broadest product selections and compatibility in our industry. The quality of the STA-RITE Pumps and Agriculture Solar power has been proven through years of operation in the field. STA-RITE Pumps, with over 1 million motors manufactured and installed. 100% of the motors are factory pressure & run tested, and are engineered with best-in-class features. STA-RITE Pumps and Agriculture Solar bring commercial grade, dependable pumps, power systems, and associated products to an ever-changing market. Customers know that a one-size-fits-all approach just is not going to satisfy today’s demanding grower. STA-RITE’s industry leading molding technology, manufacturing techniques, and 65 years of pump experience shows up in the finest pumps available. The STA-RITE Pumps and Agriculture Solar system automatically adjusts to meet changes in water demand. Instantaneous feedback from an electronic monitoring system instructs changes in order to maintain constant pressure throughout the system. 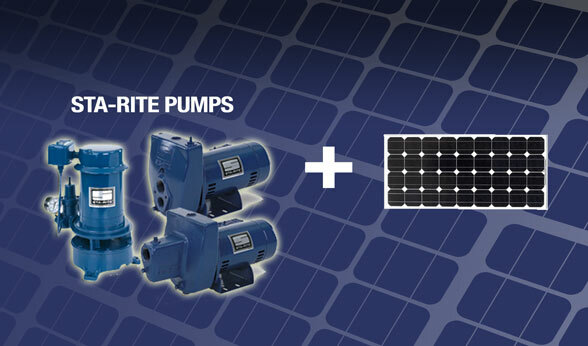 At Agriculture Solar, STA-RITE Pumps and Agriculture Energies can be your simple water pump solution. Since its founding in 1934 in Delavan, Wisconsin, STA-RITE Pumps has been a leader in providing products that you can depend on for the water you need, when and where it's needed. We serve the water well markets in over 100 countries throughout the world. Agriculture Energies systems have been dedicated to modern agricultural irrigation and successfully active in the top irrigation fields for over 10 years and continues to bring the tried and true principles and advantages of solar hybrid power. Think about it, and then make your move. Let STA-RITE Pumps and Agriculture Solar water management provide you with decades of reliability and lasting value. We invite you to explore the possibilities of our reliable hybrid solar powered pump solutions.